If you somehow didn't already know, I love unicorns. I also love stories that feature leading LGBT+ ladies. So when I discovered that Julia Ember's debut novel combined these two things, I knew I had to have it. I've had the pleasure of speaking to Julia Ember quite a bit on Twitter and she's absolutely lovely, as is her debut. Unicorn Tracks takes place in a world not entirely unlike our own where fantastical creatures are the norm. It's common for tourists to travel to Nazwimbe to go on safari and see everything from mermaids to phoenixes, but unicorns are somewhat rarer, so when safari guide and tracker Mnemba is given the job of leading a researcher and his daughter, Kara, into the wilderness in search of unicorns she has a real challenge on her hand, especially when they discover that unicorns are going missing. Mnemba and Kara decide to investigate and stumble into something much bigger than they anticipated, all while trying to resist the growing attraction between them. I love the ideas behind Unicorn Tracks; as far as I'm concerned there are way too few unicorns in fiction, and I mean that in all seriousness. There are classics like The Last Unicorn and they pop up in series such as Harry Potter, but they're very rarely included as a main feature in a story, especially if said story isn't aimed at children. There are dragons, vampires, werewolves, mermaids and faeries everywhere, but unicorns have been left behind. What I love about Unicorn Tracks is this completely new take on unicorns; I've never seen them in anything but a European/European-inspired setting, so to place them as safari animals in a country that I'm assuming is an alternate Zimbabwe is such an original idea and I loved it. I mean if I could go on safari and see unicorns I so would, and I'd never want to leave. Ember's characters are a lot of fun, too. Through Mnemba and Kara, Ember explores themes of forgiveness, choice and cultural differences, and I really appreciated that this is a book with an LGBT+ relationship at its centre that isn't about the characters' sexuality. The only thing I wanted from this book was more. I think Unicorn Tracks could have benefited from being longer, as there'd be more time to discuss everything Ember has included; the story, and Mnemba and Kara's relationship in particular, felt a little too rushed for me. There's so much here that's great, so I would have loved even more scenes of Mnemba and Kara exploring the wilderness and encountering even more mythological creatures. 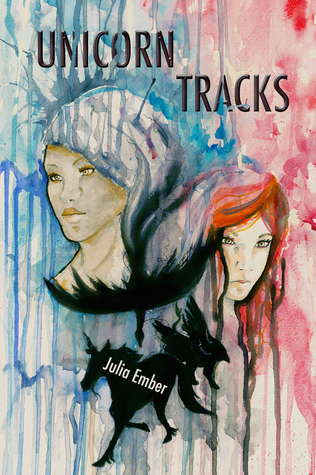 What's most exciting about Unicorn Tracks is what else we can expect from Ember as an author. We need more voices in fiction that don't treat LGBT+ characters like parables of what it means to identify as queer, but instead write fun, exciting stories where the characters just so happen to be LGBT+. I'm looking forward to whatever Ember does next!